Leave the napkin on the table until the hostess signals the start of the meal by picking up her napkin. If there is no host, wait until two or three others are seated at the table to remove your napkin from its place. Don't unfold the napkin above the table; bring it under the table and open it just above your lap. If it is a larger cloth napkin, fold it in half and place it in your lap with the fold side closest to the waist. 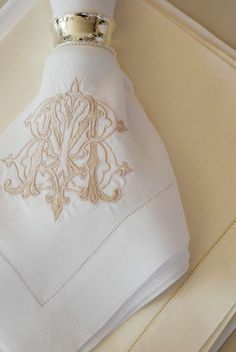 Smaller cloth napkins and paper napkins are unfolded completely. With two fingers extended behind your napkin, use it to blot your lips, first on one side of the mouth and then on the other, creating an invisible "V" over your mouth. This is done whenever you feel you might have something on your mouth and every time you are about to take a sip of your drink, to prevent smudging the rim of your glass with your lips. Raise your napkin to cover your mouth and nose if you suddenly cough or sneeze. Think of the napkin as a screen behind which you are coughing or sneezing, not as a handkerchief to wipe or blow your nose. Should you need to excuse yourself from the table during the meal, the napkin is laid in loose folds to the left of your dinner plate. Be careful that any soiling on your napkin is turned under and not in view of other diners. Never spit unwanted food into the napkin. Anything that cannot be swallowed should be discreetly removed with your fork and tucked under some other food or garnish on the plate. Keep your napkin in your lap until the hostess signals the end of the meal by removing hers from her lap. When there is no host, wait until everyone at the table is finished eating before placing your napkin, loosely folded, to the left of your plate.